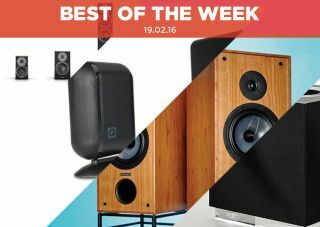 Best of the Week: Bristol Sound and Vision 2016, Naim Mu-so Qb and more | What Hi-Fi? This week Dynaudio announced its Emit range of loudspeakers, Q Acoustics unveiled its Q7000 speaker system and Rega introduced an updated version of its RP3 turntable. You'll be able to see all three in action if you happen to be visiting next week's Bristol Show. We had the usual bounty of reviews for your perusal with Naim's Mu-so Qb, Primephonic's hi-res download website and Spendor's SP2/3R2 being the highlights. MORE: Sky Q: What is it? When can you get it? Q Acoustics has announced a new 2.1 speaker system. Incorporating the old and the new, the Media 7000 reuses two satellite speakers and a subwoofer from the company's award-winning Q7000i package. The newest element of the package is the Q-AVA stereo amp, which comes with a built-in DAC and Bluetooth for wireless streaming. It'll be out in March, costing £800. If you happen to be visiting the Bristol Show next week, you'll be able to hear it in the Q Acoustics' showroom. Dynaudio has unveiled the Emit series as the Danish company's latest range of affordable speakers. Conceptualised as an "entry-level high-end loudspeaker series" it features two bookshelf speakers (M10 and M20), a floorstander (M30) and centre speaker (M15C), with Dynaudio claiming the range offers an exceptional level of performance for a modest price. At the moment there's no price or release date for the Emit range, but you'll able to hear the fruits of Dynaudio's labour at next week's Bristol Show. Another brand that will be appearing at the Bristol Show is Rega, and the company will be bringing an updated version of its award-winning Planar 3 turntable. The 'table has been in development for two years and includes a new RB330 tone arm, improved horizontal and vertical bearings and a stiffer sub-platter that Rega says will help improve the deck's accuracy. There's no info on the price or release date, but if it follows previous versions it's likely to be in the £550 range. "It’s a masterclass in timing, and it’s this that really makes the Qb character one to fall in love with"
After award-winning results with the Mu-so, Naim set themselves the challenging task of following it up. With the Mu-so Qb they've succeeded with aplomb. Smaller and cuboid in shape, the Qb has a similar design aesthetic but offers the portability its bigger brother couldn't. The sound is surprisingly big and bold for a small speaker, although the bass can get thick at high volumes. Nevertheless, it manages to retain many of the Mu-so's features at a more affordable price. This is a speaker worthy of any room. "With a great catalogue, superb website, useful content, not to mention a growing community, it's much more than just a website"
Are you a fan of classical music? Then Primephonic is the hi-res download service for you. Though its appeal may be niche, its community features are genuinely appealing, and along with a well-designed website and informative content, it's enough reason to keep coming back again and again. Aside from the issues we had with the download manager, Primephonic offers an experience for classical fans that is engaging and thoughtful. "Once properly positioned, these speakers have a lovely, smooth tonal sound tinged with an appealing degree of warmth"
Seven years have past since we last tested these Spendors and they remain as spectacular as ever. Though this speaker's sound may have fallen out favour as time has passed, it's nonetheless one of its attractive attributes. The smooth, refined tonality and big soundstage make for a rewarding experience. While alternatives are more attention-grabbing, these Spendors have a compelling, easy-going nature. They're a fantastic pair of speakers.